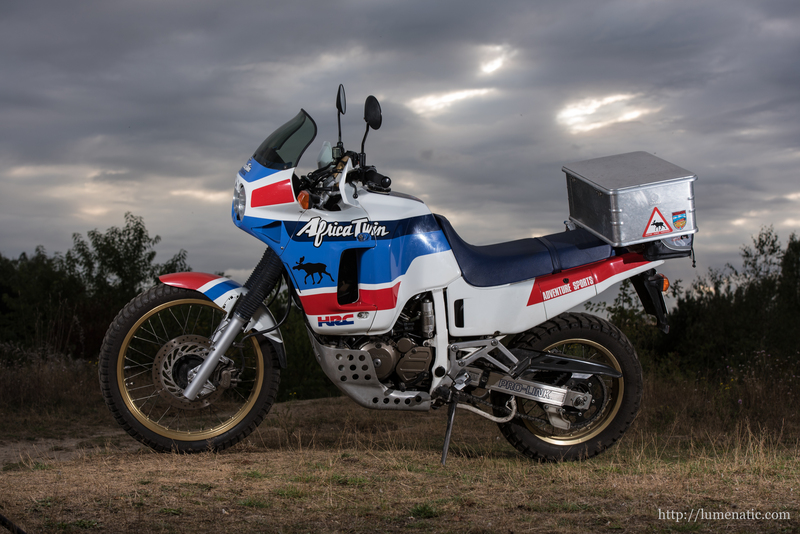 The Honda XRV 650 Africa Twin is a classic. 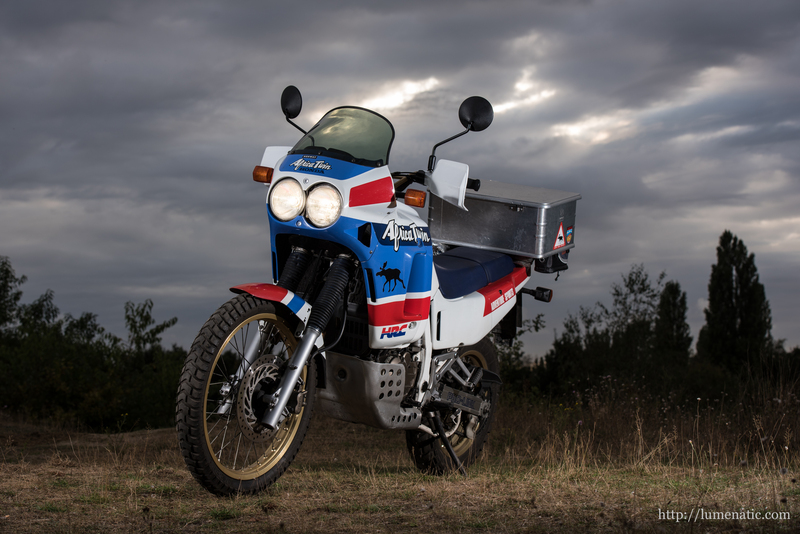 Its appearance in 1988 marked the dawning of an era of powerful offroad bikes. 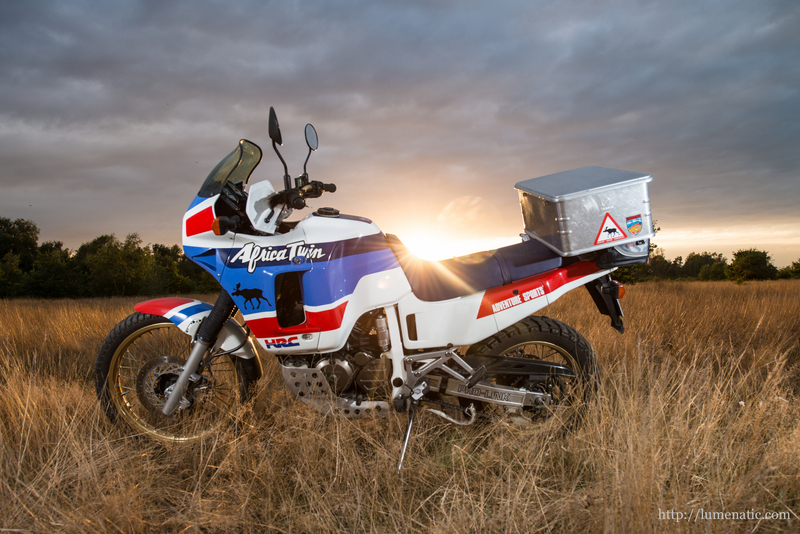 The Africa Twin is built for heavy terrain, the 657cc engine delivers 50 hp and 55 Nm of torque. 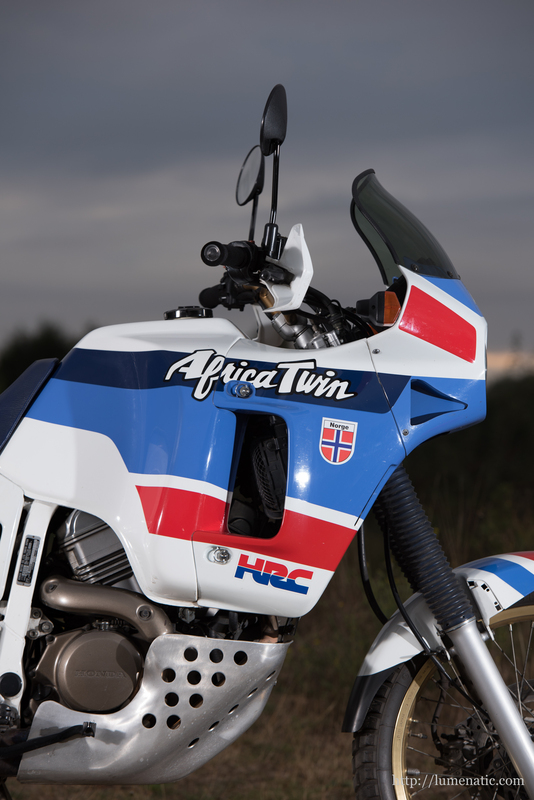 The 650cc version of the Africa Twin was only produced for two years and quickly succeeded by the 750cc version. 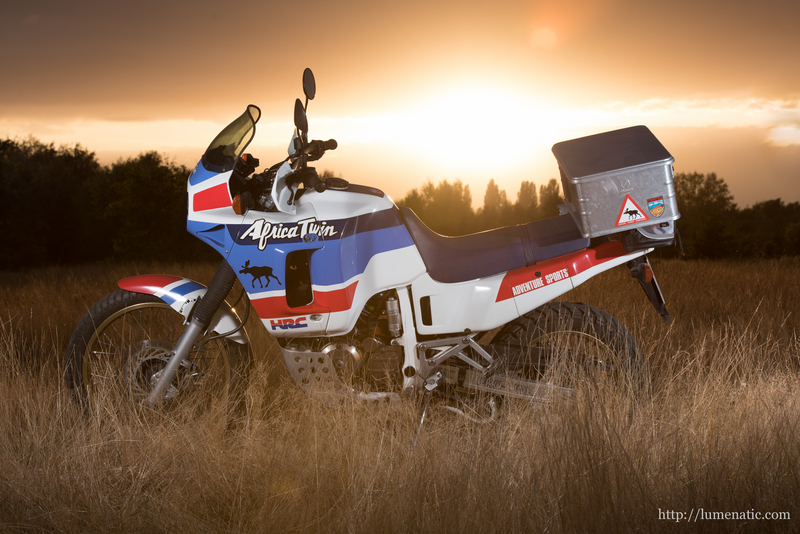 This is why I was extra happy to get the opportunity to shoot the “original” Africa Twin. 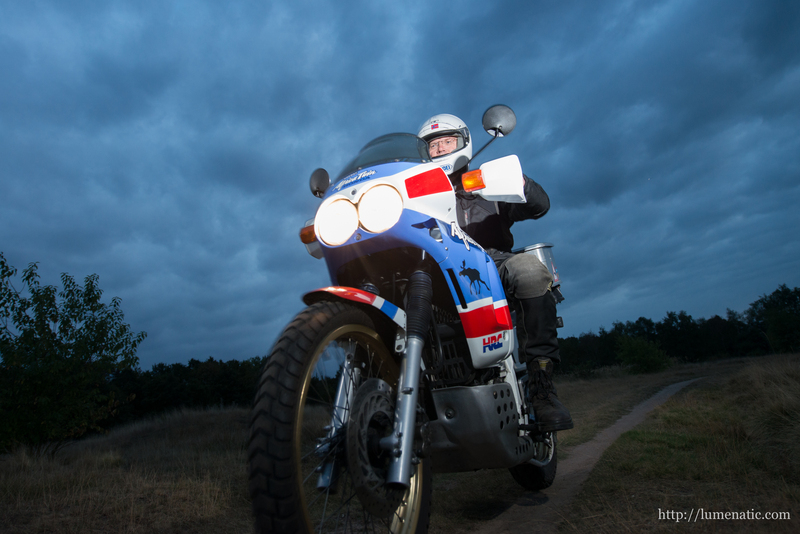 The 27 year old bike is in mint condition with a respectable 90.000 km (and still working perfectly)! 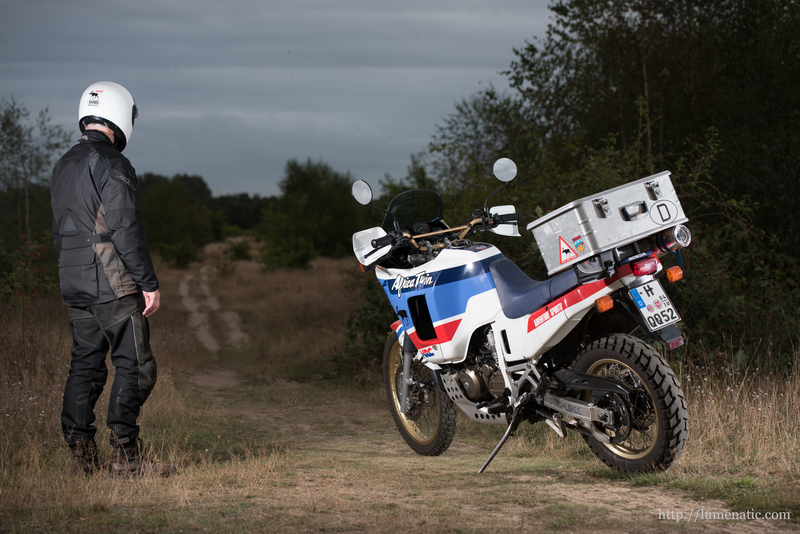 Fun fact: It was en route to the shooting, that the bike surpassed the 90.000 km mark. 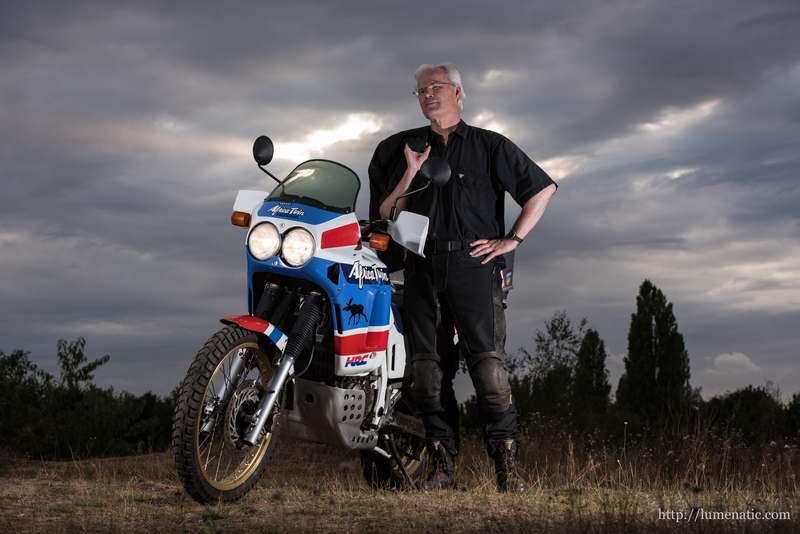 Meet Wolfgang, proud owner of this tough bike. He bought it back in 1988, so he is still the first owner. 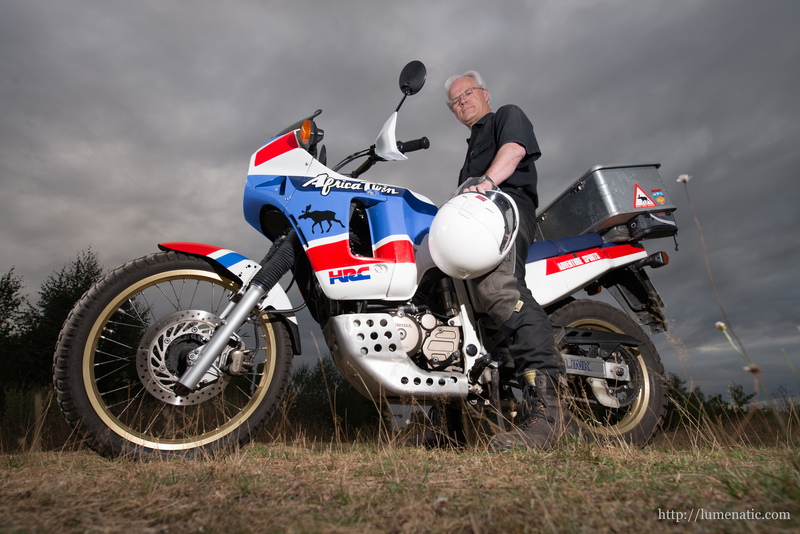 Actually it is hard to believe, that the bike is 27 years old. 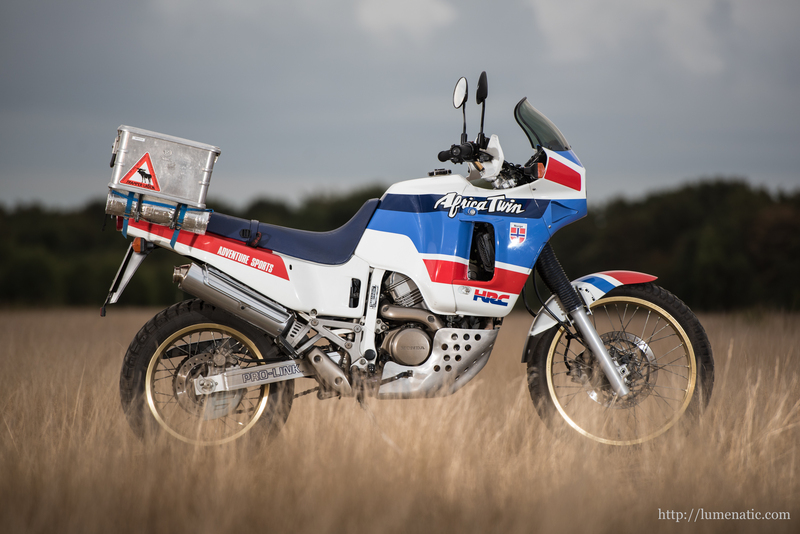 The bike is clean, the parts do not look worn or aged, everything is maintained with lots of love and technical expertise. We shot on the heath, where I conducted several one-man-shootings previously (morning and evening sessions). We shot on a small hill (small = 3 m high) and initially I wanted only to use one light, since I had to reach the location by foot. So I had one tripod with a flash and an umbrella and one flash for mastering. 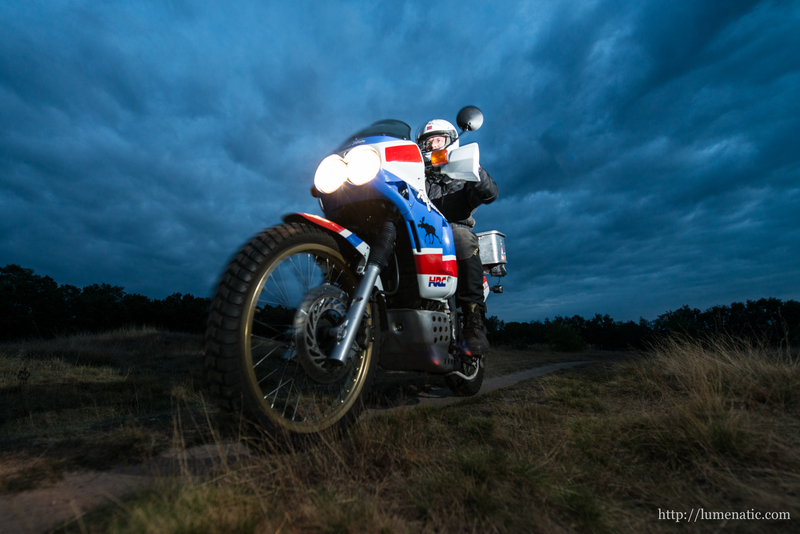 But that did not work as expected, because with only one flash (positioned left or right) one side of the bike stayed in the dark. Didn’t look good, so I switched the setup and used the second flash, too (which was intended to be used as master flash only). I set it on the camera tripod and voilà, my classic two-flash setup. The internal flash of the camera acted as master flash, which works, too. Please note, that all of the above images were shot uphill. I used the Nikkor 14-24 mm and the 70-200 f2.8 lenses on this shoot. In both cases shooting from a slightly lower angle added to the look by providing a special perspective. Getting so low some grass came in the way, and I shortly switched into garneder mode, removing some of the larger grass straws close to the lens which obscured the view. 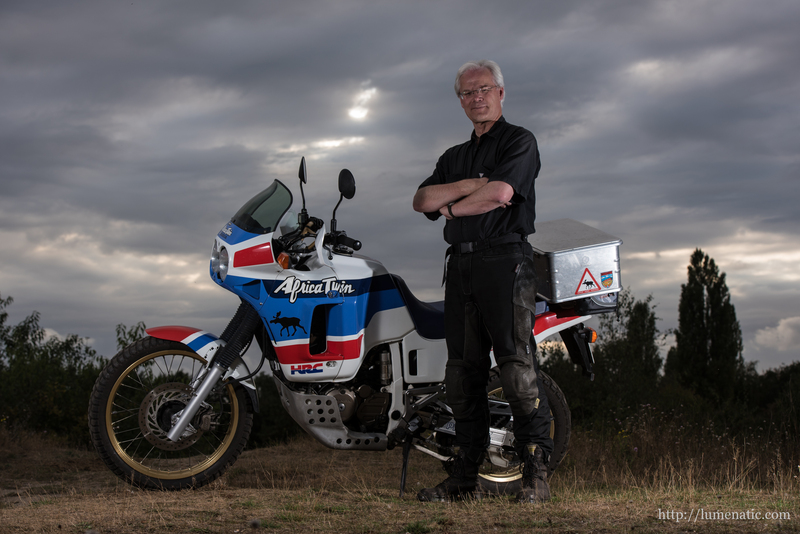 If you wonder about all the elk and norwegian flag-stickers: Wolfgang is a huge fan of Norway and regularly tours the country with his Africa Twin. It was time to move to another location ! 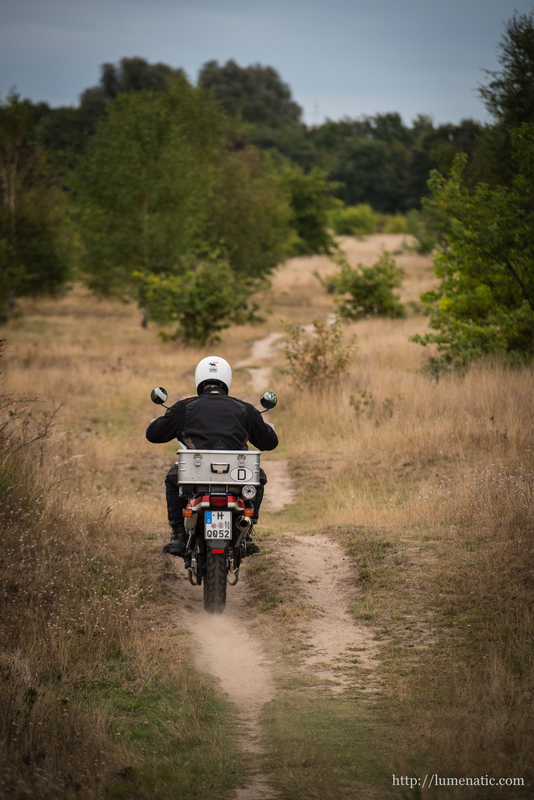 We moved a few hundred meters away from our first location and reached a patch on the heath with high, dry grass. 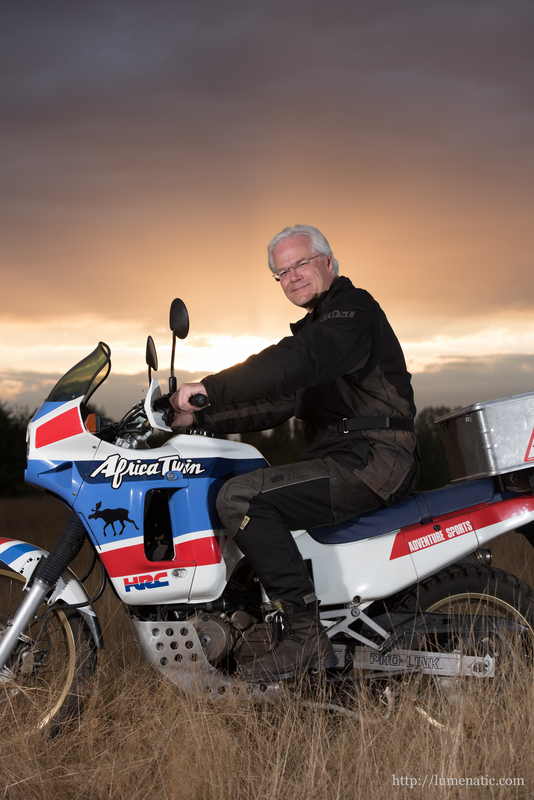 When Wolfgang parked the bike in the grass, I thought we had reached the savannah. The grass adds perfectly to the character of the bike. It looks like we are in the wild, and not on a small patch of heath in northern Hanover. In these shots we had the setting sun in our back. 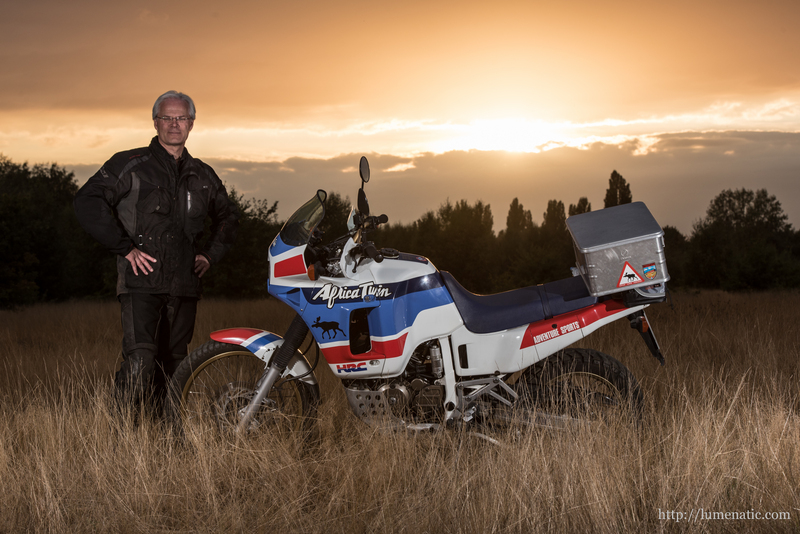 Being a fan of shooting against the evening sun, I moved the flashes to the other side of the bike and commenced shooting. The following three shots are similar, yet different. All were shot from the same perspective, but with some key differences. This one (above) was shot at 24 mm with flash. The bike is still illuminated well, but there is more sky visible. The clouds contrast the yellow grass and give the image a completely different look. Last one: Again 80 mm, but shot _without_ flash (note that there are no reflections on the fairing as in the previous images). The bike was quite dark (shot against the sun !) but by raising the dark areas in Lightroom corrected this. 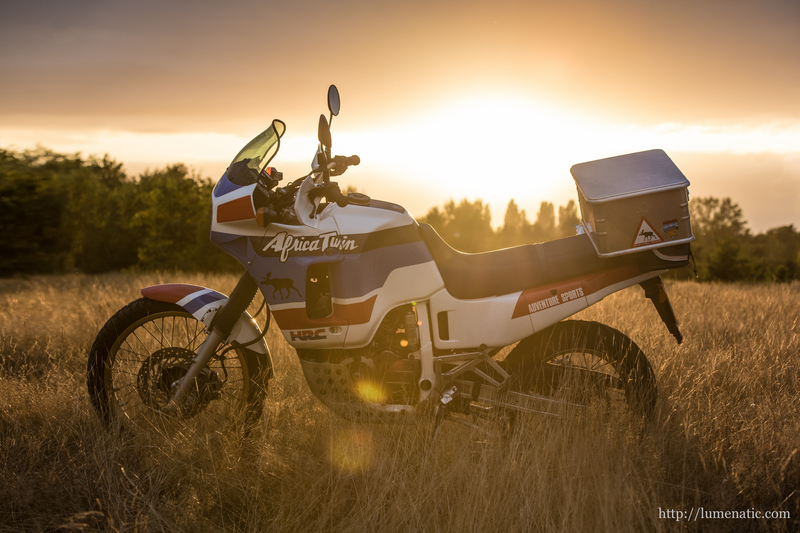 Lensflare and the natural look of the bike make this image again different. 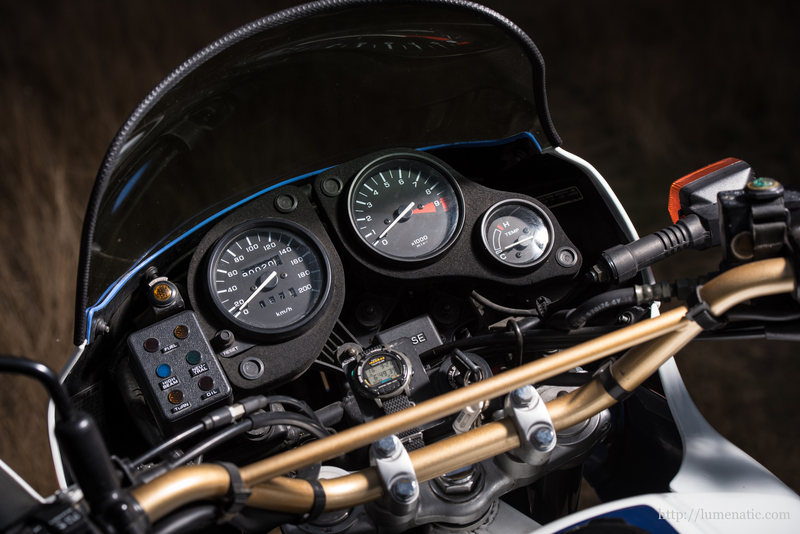 A detail shot before moving to the action part: The dashboard of the Honda XRV 650 Africa Twin. Last setting ! Magic hour had arrived and I wanted to get some last action shots. 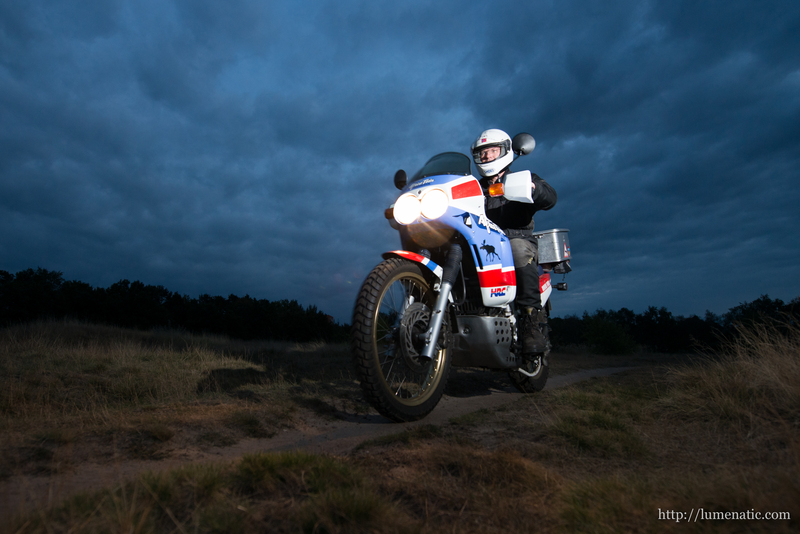 I positioned the flashes left and right to the path and instructed Wolfgang to drive by very closely to the camera. We made a few runs and I snapped several images. Especially in that situation the wireless triggering of the flashes witht the internal popup flash was difficult. I lay on the ground at the foot of one tripod to get a good close-up shot with the wideangle lens, and the slave flashes had problems receiving the light from the popup master flash. 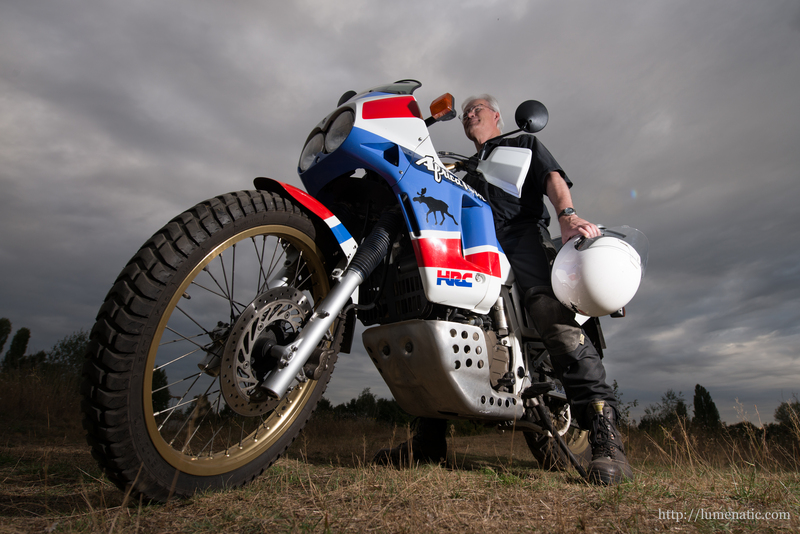 But after some test shots it worked well and we could close the session with these spectacular shots. 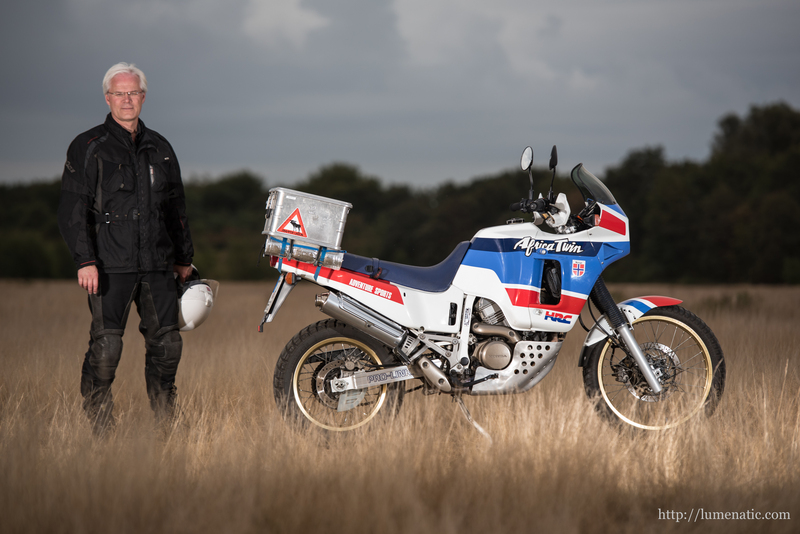 Legendary bike, great shooting session…!! The best one is without flash. It has warm and dreamy “Marlboro” look.